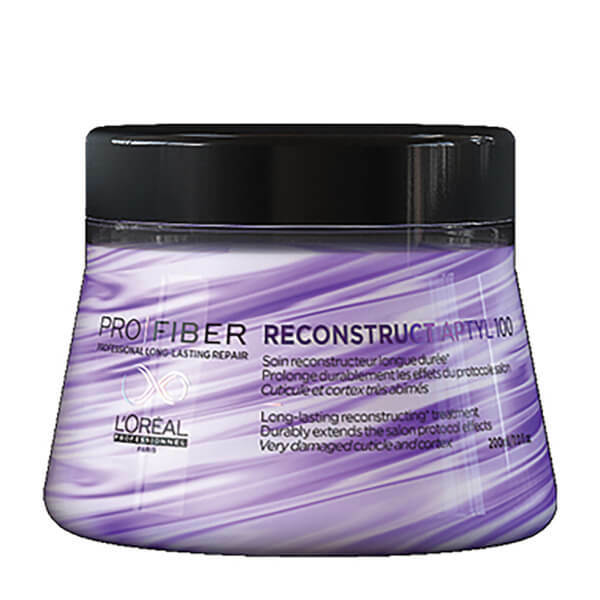 Replenish damaged hair with L'Oreal Professionnel Pro Fiber Reconstruct Very Damaged Hair Treatment, a nourishing hair treatment masque for thick, damaged or chemically-treated hair. Apply to damage areas as required, to shampooed hair. Leave on for 5 minutes. Lather. Rinse out. Aqua / Water, Cetearyl Alcohol, Aminopropyl Triethoxysilane, Paraffinum Liquidum / Mineral Oil, Cetyl, Alcohol, Lactic Acid, Dipalmitoylethyl Hydroxyethylmonium Methosulfate, Cetyl Esters, Cetrimonium Chloride, Amodimethicone,, Citric Acid, Polyquaternium-6, Behentrimonium Chloride, Myristyl Alcohol, Phenoxyethanol, Hydroxyethylcellulose, Ci 77007 /, Ultramarines, 2-Oleamido-1,3-Octadecanediol, Trideceth-6, Isopropyl Alcohol, Benzyl Benzoate, Chlorhexidine Digluconate, Ci 15850 / Red 7, Silica, Benzyl Alcohol, Parfum / Fragrance. C213326/1.